Wave Reading: Teacher Chooses a type of word or words that are to be focused on when reading( words that start with "T", Special grammar:My,Your, This, That. Categories such as colors, nouns, verbs.) Students must jump and say these words when the teacher comes to them while reading the passage. The best student may sit on the floor and be "Out" of the drill. (students must continue saying special words even from floor or they must return to their seat to participate again) When one team has all students sitting on the floor, that team wins. (Points, play game...) Continue to restart the drill until all the reading is completed. This drill continues on until each page has been read perfectly by all students. If one student is not reading well, point it out to the class and start over from the beginning. When all the pages have been read perfectly by all students then play a fun game. * Make sure that students know that when they complete this difficult drill that they will all get to play a game that they love... Use fun games to motivate. Role Play Reading: One student from each team stands in front of the class. The teacher then chooses a box from the page for the remaining students to read (after the teacher or all together without the teacher) As the 2 students don't know which box has been chosen they must do their best to act out what is being read. The best actor is the winner and is awarded points or money cards. Then 2 new children are chosen and so on. * All students read together many times. * Each student gets a chance to try and listen to the passage and act it out without seeing the passage. * Teacher chooses the boxes out of order so the acting children are unsure of which box is being read and must listen closely. Popcorn Reading: Teacher starts reading the book, when he says popcorn in the middle of the sentence and stops he then calls on another student to read. The student must start exactly where the last reader left off. The student then reads as long as he/she wants then calls popcorn "new student". If a student is lost when called upon the other team wins points. The point is for students to try to read quickly, and lose the other team, then call on one of the students from the other team in hopes he/she is unsure of where the reading stopped. *Can have students choose any one in this case students will attack slower students in hopes that they make a mistake. *Can have students that have read sit on the floor so they may not be called on again until all have read and are on the floor. Perfect Reading: One student reads one passage. If they read the passage absolutely perfectly then they may sit on the floor and be "Out". If a mistake is made stop the reader, correct the student, have the class repeat correctly, then choose a new student to try the same passage. The same passage is read, and corrected until finally it is read perfectly. When a team has completed the drill and are all on the floor then they win points/ play board game/ money cards. Restart the drill as many times as it takes to read all the required reading. Red/Black Reading: New DD grammar is in red text and all other text is in black. The teacher reads one color and the students must stand up and read when their color comes. If students don't all stand up and read together then they box is read again until they all do it well. As its easier for children to read the few words of new grammar that can be done one day, and the following time have students read all the black text and the teacher reads the few new grammar words in red. *If students are slow in standing up, or not reading together, read the box again... This drill pushes perfection for all. Pair reading: 2 students stand up to read a sentence/passage together. If both read well they may both sit down and the next 2 children stand up to read the next sentence/passage. But if one student does not read well they must continue to stand up with new groups until they read loudly and clearly. This pushes weaker students to read more (as they must read with next groups until they read clearly) with the help of one or more students. Continue to read in pairs or by 3's until all the reading is finished. *Poor students that don't read well or stand nicely can easily end up reading everything, but with the help of other groups as to not embarrass too much. Musical Chairs: The teacher reads and has students repeat. When the teacher makes a mistake students must switch seats. (any seat near or far) The slowest person is "out and sits next to the opposite wall. Students that are out must continue to read after the teacher, for if they don't they risk sending another person from their team out of the game for their lack of reading. Also the class must read the sentence again without any mistakes which then just makes a fun game take longer to get to the fun part of mistakes and switching chairs. Continue the game until there is a single student winner. Award points, money cards, or board game. Then start the drill again, play until the reading is completed. For the last lesson of each unit, let one student at a time read the book and take the place of the teacher. The student teacher reads then has the class repeat after them. After the student teacher reads a portion of the reading, they can choose who will be the next student teacher. *With this drill, reading may take a few more extra minutes. *Children seem to like having the teacher's power while reading. Spin the bottle: Students sit in a circle and spin a bottle to see who reads. C. Difficult: One person reads. *If it is read well then award points and spin the bottle again. Continue until the reading is finished. Breakaway Race: 2 children are chosen to play while all other students will read with the teacher. The 2 children will sit on the floor facing their teams with a dice or ball behind them. When the teacher makes a mistake the 2 students must turn around and race to kick the ball against the wall for a "Goal". As the 2 children on the floor do not have books they must listen to try and find the mistake or rely on watching their team for when a mistake is made the children with books must put their books on their heads to signal the kicker to turn around, race to the ball and beat the other student. After each "Goal" switch students. Play until the reading is completed. The team with the most goals is the winner. 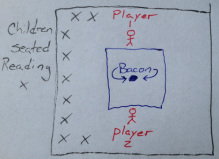 Steal the bacon: 2 children must race to steal the "bacon". 2 children that don't have books sit on the floor and listen for the teacher to make a mistake reading. All other children read after the teacher, but if they catch a mistake they yell "Get the Bacon!!!" The student to grab the "bacon" first wins. Switch students and play until the reading is completed. The team that has Stole the bacon the most is the winner.